All the Hymns, music and words are COPYRIGHT PROTECTED. You may not Copy them without a LICENCE. To apply for your licence CLICK HERE. 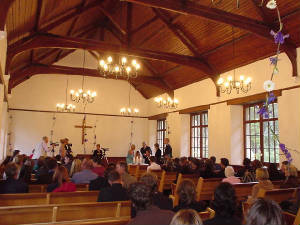 Music is a vital ingredient in your church wedding service. It sets the atmosphere and enables everyone to join in the singing of your chosen hymns. Most Christian wedding services include two or three hymns. However, there is no set rule as to how many hymns can be sung during your service. However, you must discuss your preferences with the minister who's approval is needed. When considering hymns for your service, you should always bear in mind the vocal talents of your guests. Unless they are known to be good singers, you should avoid unfamiliar hymns and hymns with high notes. This is particularly relevant if you will not be using the church choir. The last thing you want is an embarrassed silence! This hymn is about celebration and praise, making it suitable as the first hymn sung at the beginning of the service, which is in praise of God in whose presence everyone has assembled. This hymn is suitable as the second hymn sung after the marriage ceremony, which is about praise and celebration of the union. It is also suitable as the third hymn that is sung after the signing of the register, which usually speaks of the desire that God goes with you into the future to help you live out your vows. This hymn is about celebration and praise, making it suitable as the first hymn sung at the beginning of the service, which is in praise of God in whose presence everyone has assembled. It is also suitable as the third hymn that is sung after the signing of the register, which usually speaks of the desire that God goes with you into the future to help you live out your vows. Keep me praising 'till the break of day. Keep me praying 'till the end of day. Keep me burning 'till the end of day. Keep me resting 'till the end of day. This hymn is suitable as the third hymn sung after the signing of the register, which usually speaks of the desire that God goes with you into the future to help you live out your vows. This hymn is suitable as the first hymn sung at the beginning of the service, which is in praise of God in whose presence everyone has assembled. And take me home- what joy shall fill my heart! This hymn is suitable as the second hymn sung after the marriage ceremony, which is in praise and celebration of the union. It is also suitable as the third hymn that is sung after the signing of the register, which usually speaks of the desire that God goes with you into the future to help you live out your vows. Thou to Calvary didst go. This hymn is suitable as the first hymn sung at the beginning of the service, which is in praise of God in whose presence everyone has assembled. It is also suitable for Easter weddings. Widely as his mercy flows. This hymn is about marriage and eternal life, and is suitable as the second hymn sung after the marriage ceremony, which is in praise and celebration of the union. It is also suitable to sing during Communion, if you decide to include it during the ceremony, and also at Easter weddings. Rest assured this troubador is acting on his part. And there is love. there is love. Well then what's to be the reason for becoming man and wife? And if loving is the answer, then who's the giving for? Do you believe in something that you've never seen before? Oh there's love, there is love.